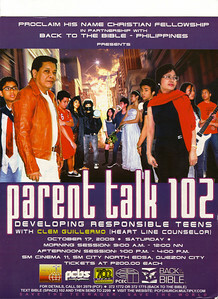 Pastor Clem Guillermo, Heart Line counselor, will be holding another parenting talk on October 17, 2009. This one is specifically targeting parents with teenagers. This one is going to be held at SM North Edsa Cinema 11, with the morning session starting at 9:00 Am and the afternoon session starting at 1:00 PM. Tickets cost P200 per head. 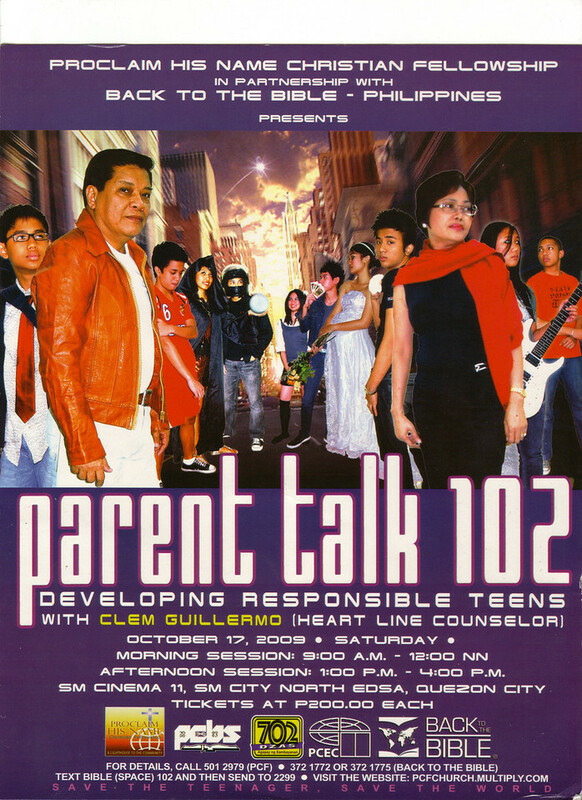 We have attended their Parenting 101 talk and found it a very fruitful, enlightening experience. A great, cheap date idea too. I am really encouraging parents, even those without teenagers yet, to attend so they can prepare themselves and change themselves in order to bring about positive changes in their own kids. Plus, teenagers today have many different concerns than the ones we had to deal with growing up, so it's key for parents to keep abreast of what's up and what's new so they can remain authorities for their children.